Brush Research Manufacturing Co., Inc. has been a leading supplier of specialty automotive brushes for the automotive industry since 1958. Our automotive brush selection includes several specialty brushes for diesel automotive maintenance and diesel engine overhaul. We make specialty automotive brushes for use on Cummins, Caterpillar, Detroit Diesel and International Harvester models. Applications include brushes for injector nozzles and pre combustion chambers, copper polishing and seating, injector cup, injector cup retainer, injector cavity and plunger bore cleaners. Most automotive brushes are made in a choice of carbon steel, stainless steel or nylon filaments and can be supplied with a plastic handle or cut for use under power. In addition to our specialty automotive brushes for diesel, BRM makes a full line of automotive brushes for general automotive overhaulincluding automotive brushes for crankshaft oil holes, valve guide brushes, oil line and gallery brushes. Our line of oil line and gallery brushes feature all popular sizes and are made with high-density nylon 6-12 or carbon steel filaments. These automotive brushes are designed for cleaning feed line holes, main bearings, lifter bores, main oil galleries, push rod holes and valve guides. 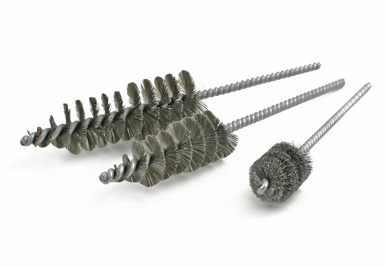 We also feature our specialty automotive brushes in kit forms for the most popular applications. Automotive brushes kits include a 5 piece oil gallery brush set in nylon, a 9 piece kit for oil lines, a 7 piece valve guide kit in either nylon or carbon steel, and a complete 29 brush kit for oil lines and galleries. 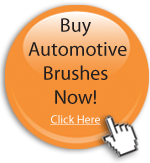 Take a look at our selection of automotive brushes to learn more about the various applications. If you're ready to order yours today, please contact a distributor. Brush Research manufactures our specialty automotive and diesel brushes under the most rigid quality standards. As an ISO 9001:2008 certified company, BRM is committed to making quality products. 100% of our specialty automotive and diesel brushes are made in the USA. We offer application assistance and a full test lab for your most difficult projects.